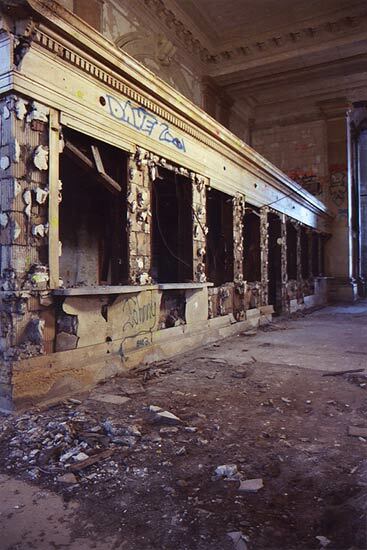 Recently, Michigan lawmakers discussed the possibility of using some Federal stimulus money to renovate the dilapidated Michigan Central Depot which has stood empty since 1988. Now ringed in barbed wire and 'tagged' with graffiti, the massive Detroit building seems to be perched at a high ledge awaiting it's fate. Detroit City Counsel wants to demolish the building but, Michigan legislators think it could be used as a Michigan State Police lab, a Homeland Security border protection office and an international trade processing center. This sounds great at first but is it really worth it? The property has very little parking space to support the 500,000+ square feet of space within the building. This is due to fact that when the building was designed in the early 1900s cars were a novelty and passengers came to the secluded station via trolley car from the city. I'm torn on this subject. The building, in it's day, dominated the city skyline. Richly decorated inside and out in marble the Michigan Central Depot was a showpiece of architecture and engineering. It is still an incredibly attractive building even in it's decayed state and resides on the National Registry of Historic Buildings. The big question here is this, can it be sustained? Rail travel is rare these days and the proposed uses by the state would barely make a dent in the space available within the vast building. Who will pay to keep the heat on in a bitter Michigan winter? Not to mention the estimated 100 million dollar estimate to renovate the building to usable status again. As much as I loath to see a historic building lost to the wrecking ball, I don't see how this building can be of any further use. The layout of money to get everything up to health and safety codes which will allow the building to be reopened is just too great. The Depot has sat far too long and I don't believe there is any way to turn back the clock now. I have looked upon that edifice more than once, and wished for some renovation magic. Ghastly amounts of money to be spent, a true money pit is all I can see for it. I probably would not spend the money if I was in control of it's fate, no matter how badly I'd want to. However, looking at it from a historic site perspective.... Many a historic site or building has been raised from the ashes, costing more than it would to create it anew, with only moderate concern of the cost. Fundraisers are held, concerned citizens are rallied, and money is raised. Lets face it though, this bloomin' thing is huge! The thought is beyond ambitious, with little return for the state's buck. Parking, heating and upkeep are the least of its issues I don't doubt. What is it that would make it worth it? For me it would have to be a symbol. A symbol that people can rally behind, a real reason that this one really NEEDS to be saved. Some part of its architecture, or history that makes it worth the 100 million dollar pricetag. ( Which I think to be underestimated.) AND...to make it for a state lab alone is not enough. The only ones to see it are select people. For me, it would have to be for a greater good. One that most people can go to see, look at, marvel at, and say WOW. Not all parts need to be public, but some parts should be if the public is paying for it. Why save it otherwise - it wouldn't be worth it. Still, I'd wish for it. "worth the 100 million dollar pricetag. ( Which I think to be underestimated.)" This is not the price for the entire renovation, this is just what would be needed to get the building safe enough to reopen. I'm sure complete renovation would cost 2-3 times this amount. I too wish to see it restored yet, I am a pecimist.